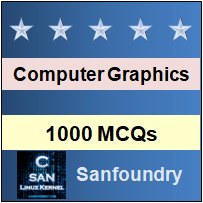 This set of Computer Graphics Multiple Choice Questions & Answers (MCQs) focuses on “Clipping Operations”. 1. What is the primary use of clipping in computer graphics? Explanation: The primary use of clipping in computer graphics is to remove objects, lines, or line segments that are outside the viewing pane. 2. A polygon can be clipped using clipping operations. Explanation: A polygon can also be clipped by specifying the clipping window. Sutherland Hodgeman polygon clipping algorithm is used for polygon clipping. 3. Which vertex of the polygon is clipped first in polygon clipping? Explanation: In polygon clipping, first the polygon is clipped against the left edge of the polygon window to get new vertices of the polygon. So, it is the top left which is clipped first. 4. How many methods of text clipping are there? 1) All or none string clipping 2) All or none character clipping 3) Text clipping. 5. A bitmap is collection of ___________________ that describes an image. Explanation: A bitmap is a collection of pixels that describe an image. It is a type of computer graphics that the computer uses to store and display pictures. 6. We can change the size or resize the bitmap image. Explanation: We can’t resize the bitmap image. When the bitmap image is resized, the image pixels get distorted. It is one of the main disadvantages of the bitmap. 7. In line clipping, the portion of line which is _____________ of window is cut and the portion that is _____________ the window is kept. Explanation: Line clipping follows the same algorithm that is in the case of point clipping. So, in line clipping also, we will cut the portion of the line which is outside of the window and keep only the portion that is inside the window. 8. ‘Skala’ is an example of which type of clipping? Explanation: Skala is a type of clipping operation which can be used for a line or line-segment clipping against a rectangular window, as well as against a convex polygon. Its algorithm is based on homogenous co-ordinates and duality. Explanation: Vatti is used in polygon clipping. It allows clipping of any number of arbitrarily shaped subject polygons. It can also be used to clip any number of arbitrarily shaped polygons. Explanation: An area which is related to the visible surface determination (VSD) is called culling. ‘Viewing frustum culling’ and ‘Backface culling’ are examples of some culling algorithms.